Catalyst is a Mac-based video and lighting software suitable for a wide range of uses including concerts, theatre and arts, corporate events, TV and installations. 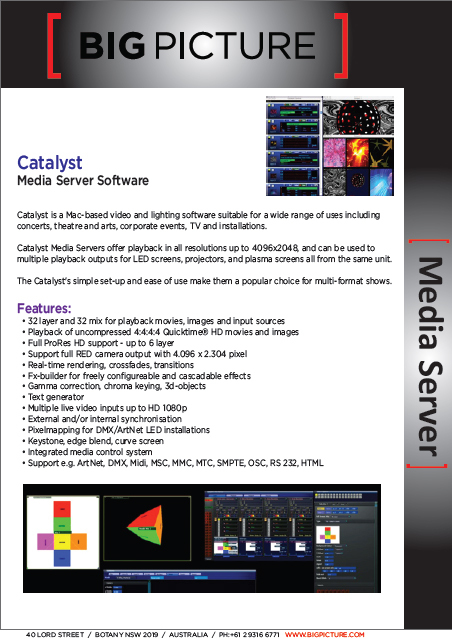 Catalyst Media Servers offer playback in all resolutions up to 4096×2048, and can be used to multiple playback outputs for LED screens, projectors, and plasma screens all from the same unit. The Catalyst’s simple set-up and ease of use make them a popular choice for multi-format shows. 32 layer and 32 mix for playback movies, images and input sources. Playback of uncompressed 4:4:4:4 Quicktime HD movies and images. Full ProRes HD support up to 6 layer. Support full RED camera output with 4.096 x 2.304 pixel. Real time rendering, crossfades, transitions. Fx-builder for freely configurable and cascadable effects. Gamma correction, chroma keying, 3d-objects. Multiple live video inputs up to HD 1080p. Pixelmapping for DMX/ArtNet LED installations. Keystone, edge blend, curve screen. Support e.g. 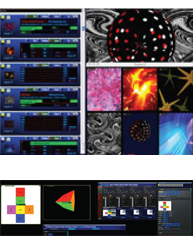 ArtNet, DMX, Midi, MSC, MMC, MTC, SMTPE, OSC, 232, HTML.